Although it only takes a day to complete, the Golden Circle drive is the highlight of any Iceland visit. This popular route loops past waterfalls, geysers and all the spectacular scenery that makes the country a photographer’s dream. Not only are there some fantastic windshield views on the drive, but three of Iceland’s top natural attractions are also located along the route. So pack a picnic lunch and get ready to enjoy the scenic south on this fun Reykjavik side trip. The good news is, the Golden Circle route is an easy drive from Reykjavik. The roads are good, and there are plenty of signs along the way. The 190-mile route includes stops at Thingvellir, Geysir and Gullfoss, and features a beautiful country drive back to the city. The bad news is that accessible rental vans are nearly non-existent in Iceland. That said, station wagons are widely available; so if you can transfer, fold up your wheelchair and stow it in back, that might be an option. If not, there are several tour companies that can provide accessible Golden Circle tours. Prime Tours (+354 470 1000, http://primetours.is) can customize a Golden Circle tour to meet your specific needs and interests. Their accessible van can carry one wheelchair-user and four other people, and their guides are well versed about access needs. Unfortunately their ramp consists of two separate rails, so this tour won’t work for scooter-users. Reykjavik Excursions (+354 580 5400, www.re.is) can also accommodate some slow walkers on their Golden Circle motorcoach tours. In order to participate, passengers must be able to board the bus on their own and have their wheelchair stowed below. Located just 31 miles east of Reykjavik, Thingvellir National Park (www.thingvellir.is) is the first stop on most Golden Circle tours. Noted for both its beauty and geological value, this UNESCO World Heritage site is where the oldest existing Parliament first met in 93. People traveled to the Parliament sessions from all over the country and erected stone and turf shelters to protect them from the elements. Today, ruins of those structures can be seen in the surrounding fields. The assembly, which was held outside, took place at the Logberg (Law Rock) and the Logretta (Law Council). Unfortunately their precise locations are unknown, however interpretive panels that outline the history of the site are located throughout this national shrine. The site was also designated as a national park in 1928 because of its tectonic and volcanic features. The continental drift on the North American and Eurasian tectonic plates can clearly be seen in the cracks and faults that are found in the area. Access is variable throughout the site. Although paved pathways lead past the interpretive panels, there are a lot of rocks on the paths. Still, it depends on the time of year, and how recently the paths have been cleared. Some of the walkways may be a little steep, but there’s no harm in just doing as much as you can. It’s still a great stop as the drive around Lake Thingvallavatn is absolutely beautiful. 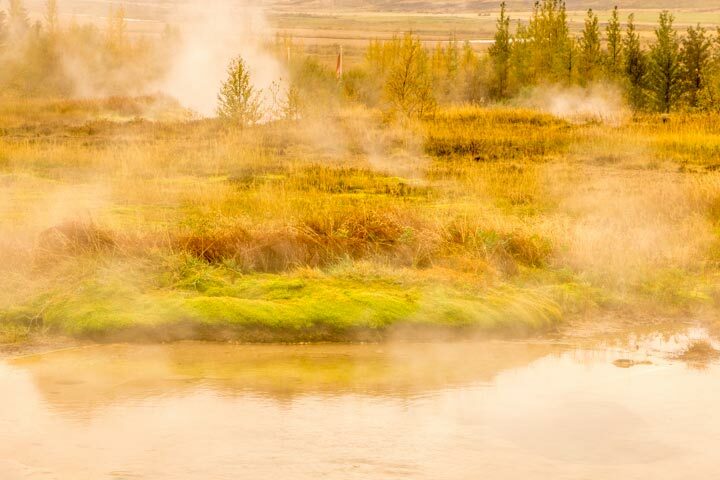 From Thingvellir, the route continues east to Highway 35, where you’ll find Geysir, a site of high geothermal activity. There’s level access to the Visitor Center, which has automatic doors and barrier-free access throughout the building. Inside there’s a restaurant, a cafeteria, a gift shop and a small collection of interpretive exhibits about the geothermal area. An accessible family restroom is also located in the building. The geothermal area is located across the street, and although there is a cross walk right in front of the gift shop, there are no curb-cuts on either side of the road. The accessible crosswalk (with curb-cut access) is located on the left of the Visitor Center, in front of the hotel. Across the street, a paved brick pathway leads around the Haukadalur geothermal area, which contains mud pools, fumaroles, algal deposits and geysers. The highlight of the geothermal area is the Strokkur geyser, which erupts every four-to-eight minutes. And although this Old Faithful of Iceland erupts regularly, some eruptions are more spectacular than others, so stick around until you catch one of the 30-foot high displays. Just down the road from Geysir, you’ll find the crown jewel of the Golden Circle route, Gullfoss (www.gullfoss.is). Literally translated Gullfoss means “golden falls”, and on sunny days there’s usually a shimmering rainbow over the falls. Accessible parking is located near a level boardwalk that leads out to an overlook. Even if you can’t manage the walk to the overlook, you’ll still get an excellent view of the double cascade falls tumbling down the rugged canyon, from just about anywhere along the boardwalk. There is also stair access to an upper overlook, but the view is actually better from the lower overlook. Either the way, the second largest waterfall in Iceland is definitely worth a stop, and it’s the perfect way to top off any Golden Circle drive.